Since you're already here learning how to use MoneyWell, you don't need to worry about the third choice and the Sample document is mainly for trying MoneyWell before purchasing the full package, so let's click on Start a New Document. 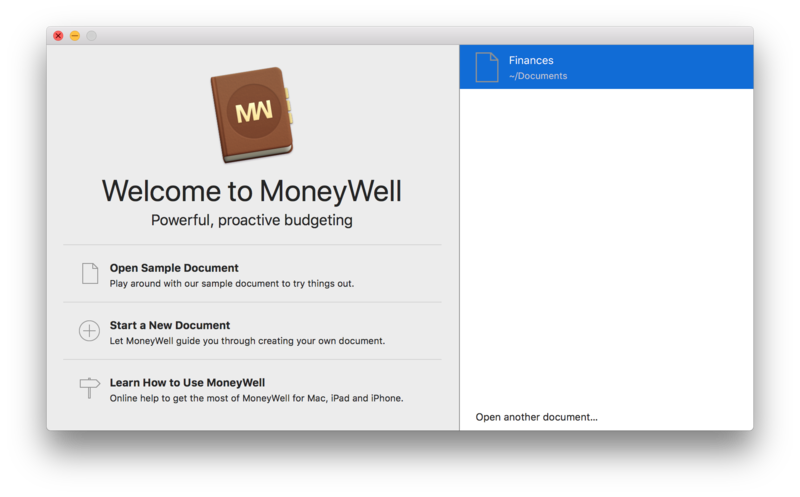 A new document window will appear and ask you to give your new MoneyWell document a name to save it. You can also pick where to store your document at this point. If you aren't sure where to put it, your Documents folder is a great spot. Click Save to store your new document. If you have used a personal finance app and have exported your transaction history to one or more QIF files, you can choose Import Accounts to import your existing banking activity and you'll have a fully populated document (see Importing Transactions for more details about the import process). Let's assume you don't have any information to import and you want to create your document from scratch. Click Use New Account Guide to bring up the "New Account" panel. 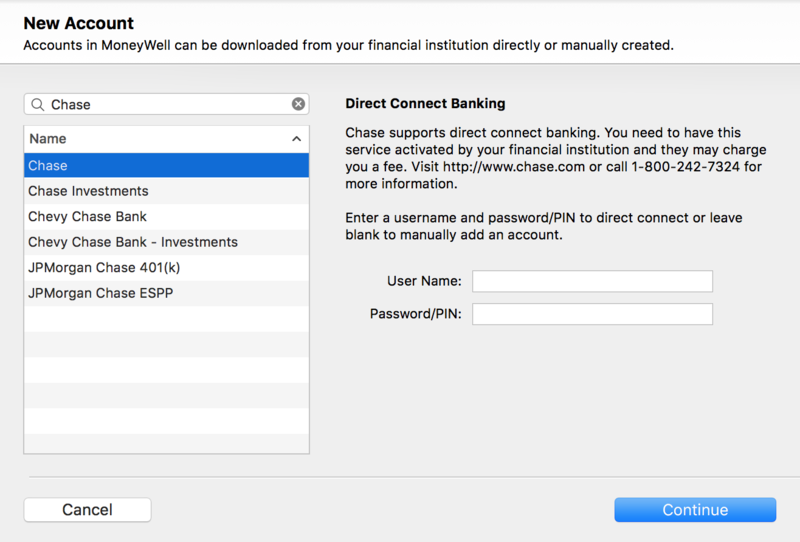 If you have Direct Connect Banking enabled for your account, MoneyWell can discover your accounts automatically. If you want to download transactions from your bank's website or manually enter them, you don't have to pick a financial institution. Just leave the "No Financial Institution" choice selected. Once you have one or more accounts, you can start categorizing your transactions by assigning them to buckets. Before you build your budget, it's good to know your historic spending. You can quickly set the bucket on more than one transaction at a time by selecting them and dragging them to bucket. Once you have a clean, categorized list of transactions, you can set up your budget.